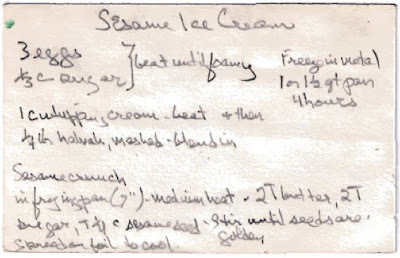 Here's my grandma's original handwritten recipe card. I have to confess that I didn't really follow the instructions. First of all, I had a hard time reading the handwriting, and some of the instructions seemed incomplete. I liked the concept but thought I could make it better, so ultimately, I decided to adapt it. 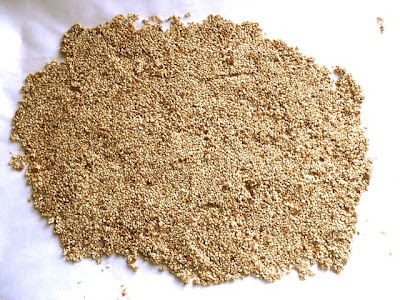 Here's the halvah. It has a soft crumbly texture and tastes somewhere between peanut butter and cookie dough. 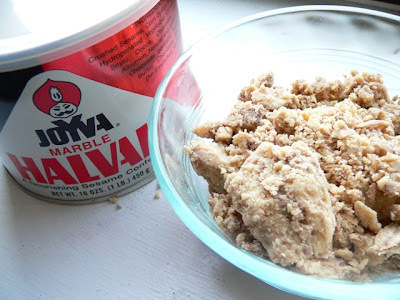 I found this canned halvah at Safeway in the ethnic foods aisle. If there's some sort of Middle Eastern store in your neighborhood, I'd recommend checking there too. Feel free to leave a comment about where to find good halvah—I'd love to know! Now onto the sesame crunch. 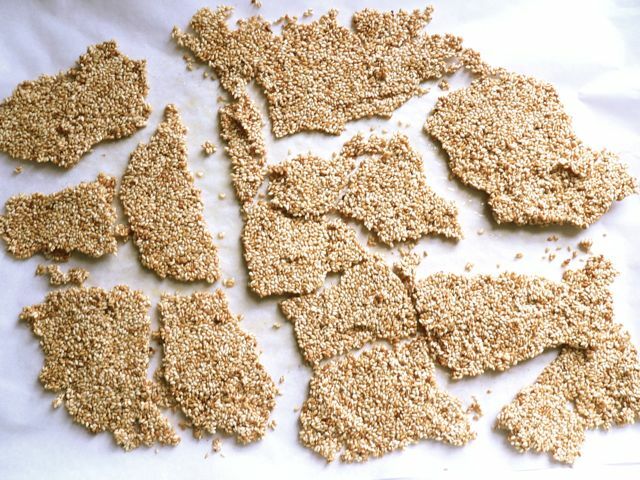 Basically, just heat butter, sugar, salt and sesame seeds until the seeds brown. Then spread it thinly on a piece of parchment paper. There was no salt in the original recipe, but I liked the idea of a salty sweet crunch, so I think it was a good addition. Once it cools, break the brittle into pieces and serve it with your ice cream. In a medium saucepan, combine milk and heavy cream over medium heat. Whip egg yolks and sugar in a separate bowl until frothy. Just before the milk begins to simmer, pour about half the cream into the bowl of egg yolks, adding it half a cup at a time and stirring constantly. Gradually pour the egg mixture back into the saucepan. Continue to stir until liquid thickens into a custard and coats the back of a spoon. Remove from heat. 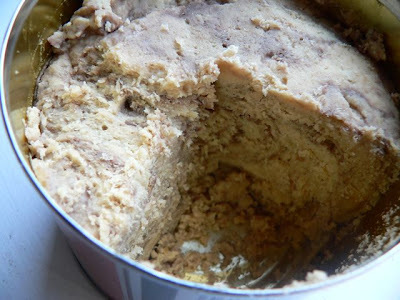 Mash up the halvah and add it to the hot custard. Use an electric hand mixer of blender to thoroughly combine it. 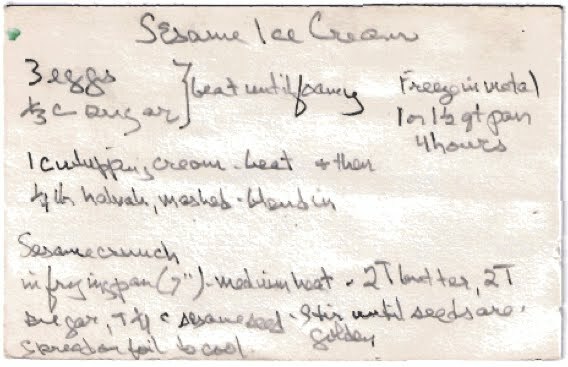 Chill the custard using an ice bath or refrigeration. 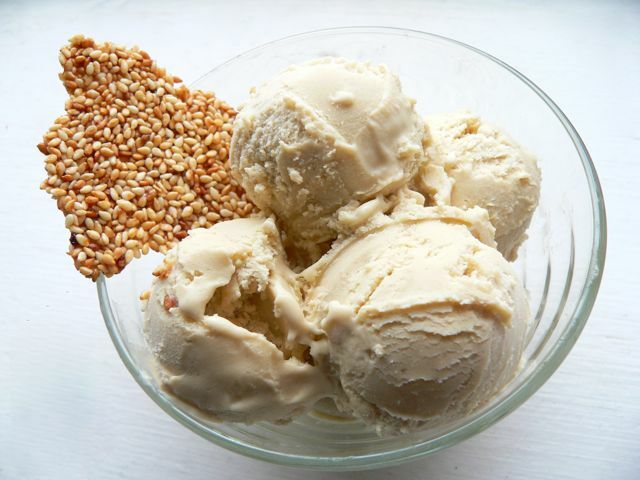 When it's cold, pour it into an ice cream maker and freeze according to manufacturer's instructions. Melt butter in a frying pan, then add sugar, salt, and sesame seeds. 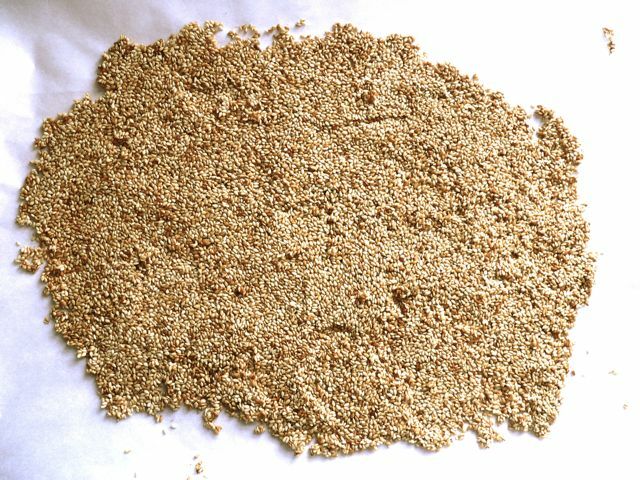 Cook over medium heat until seeds are crispy and golden brown. 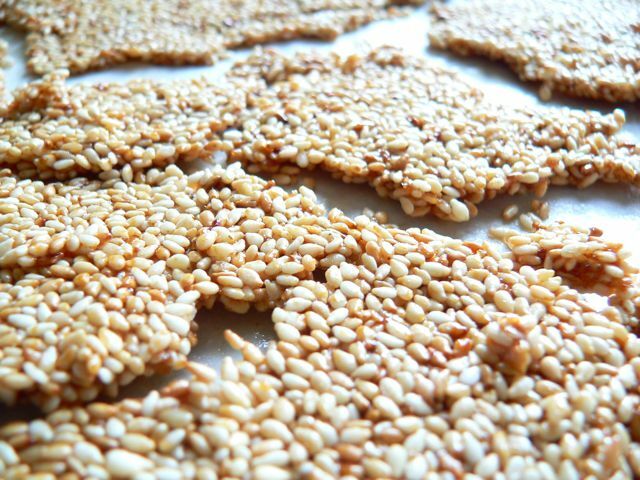 Spread the seeds thinly on parchment paper or foil. 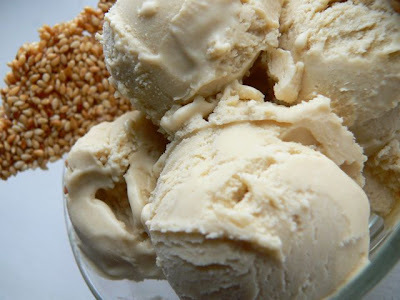 When it cools, break the brittle into pieces and serve with your ice cream. I really like the brittle part of the cooking. Thanks for this one!